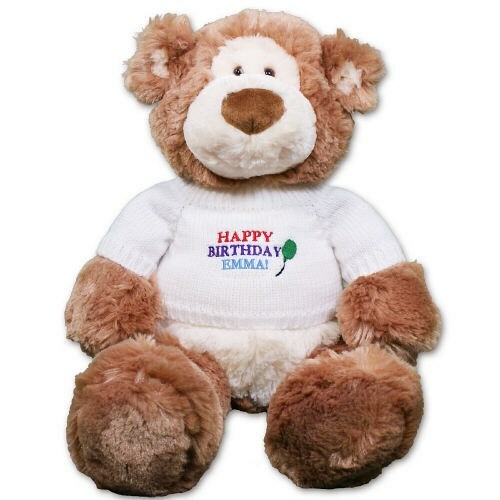 Embroidered Happy Birthday Teddy Bear - 18"
Celebrate any birthday with a timeless keepsake to cherish year after year. Whether they are celebrating a 1st birthday or a 100th birthday, everyone is sure to love the thought put behind this lovable gift idea. Our premium, super soft Gund Bear has amazingly silky fur. With a broad smile and big nose, this two tone bear is a big winner with everyone who holds it! Measures about 18 inches and includes FREE Personalization! We will embroider the Happy Birthday Sweater with any name to fulfill any birthday wish. Free gift wrapping and a free gift message is included to create a thoughtful presentation. Additional Details We have created a wonderful collection of Personalized Plush Birthday Gifts to help celebrate the wonderful occasion. Make any birthday the most favorite by shopping 800Bear.com. You may also like to take a look at our fun Personalized Birthday Keepsake Gifts as well!